The PEERSTRAT sessions enable you explore ways to make your business get bigger, grow faster and be the very best in your industry. #1 Build Unique Business – Eliminate Competition! #2 Recreate Brand – Tell a Compelling Story! 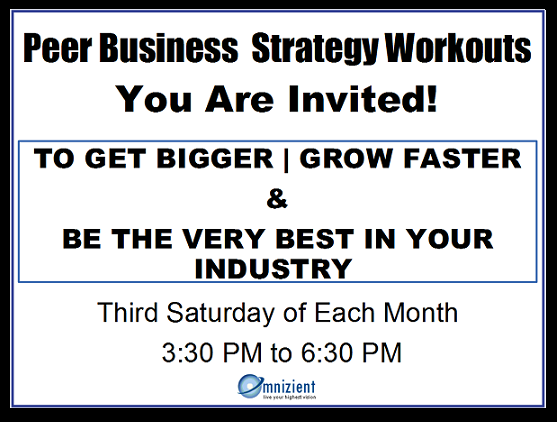 #3 Maximize Revenues – Penetrate Newer Markets! #4 Maximize Profits – Transform Business Processes with Standard Operating Procedures (SOPs)! #5 Track Success – Identify Critical Success Measures – What Gets Measured Gets Done! Participation fees are nominal INR 1000 to cover basic cost of the event. Tea and Snacks would be served during the session. Please confirm your participation by marking an email to raj @ bizvidya.com.